Mix the flour with the baking soda then add the eggs, the yogurt and the salt, oil, sugar and the cinnamon. 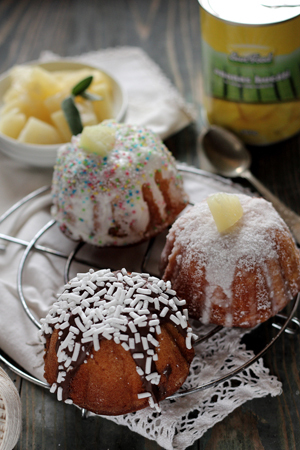 Chop the pineapple and powder them with some flour. Add them into the mixture and keep mixing. Add the mixture in 3 mini cakes patty pans. Bake them for 25-30 min.